Jean Delville the Belgian symbolist painted his masterpiece "Treasures of Satan" back in 1894 depicting Satan in a sensuous under sea world with the devil as a ballet dancer like man curiously with wings transformed into tentacles which perhaps have ensnared the souls. b) Origins of Delville's composition? 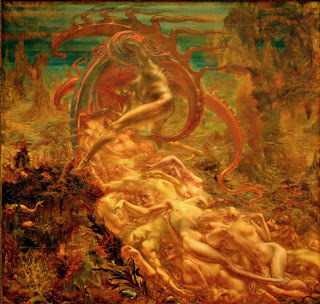 However I decided that the Zigzag devil from the Bradshaw Caves had something to do with the design, found shortly before Delville painted his work, as well as at least one dragon by Gustave Moreau and since Delville was a very sensuous painter, he explored the idea for this Lucifer in a very sensual way. 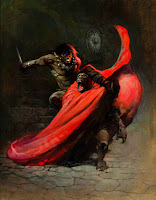 Perhaps those who were going to take in the message who were also fans of his art, would be less horrified since despite being damned, the ensnared souls appear to be comfortable in their state. 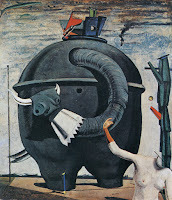 A curious phenomena since then was the fact that one artist would paint a picture referencing his work, so far I have seen that Otto Dix started with his Skat Players painting, and then the following year Max Ernst would do his own with Celebes, perhaps abstractly incorporating elements of Dix's work. 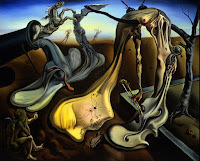 Picasso's Guernica followed over a dozen years later and then Dali would become inspired to head that direction himself along with other artists referencing Delville's painting and the works by other artists who came since. 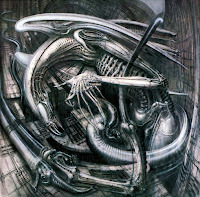 Perhaps this had died out with the surrealist movement, and then Giger continued with this tradition regarding that particular Delville painting with his Alien Monster IV in the late 1970s. Here I list paintings by painters from and break them down into decades, and we'll see how certain paintings develop and certain works become a catalyst for many other painting. There is also my Henu Barque list that runs along side this list and intersects as points because the connection with this Henu Barque appears to have been made by various people interested in contributing something to this trail of paintings. One might wonder if sometimes it's a conspiracy involving secret organisations that's going on to include the Henu Barque for suspicious reason, or perhaps it might be because of some sort of relevant publication elsewhere that might have made the connections that I'm talking about and I am still to find it.